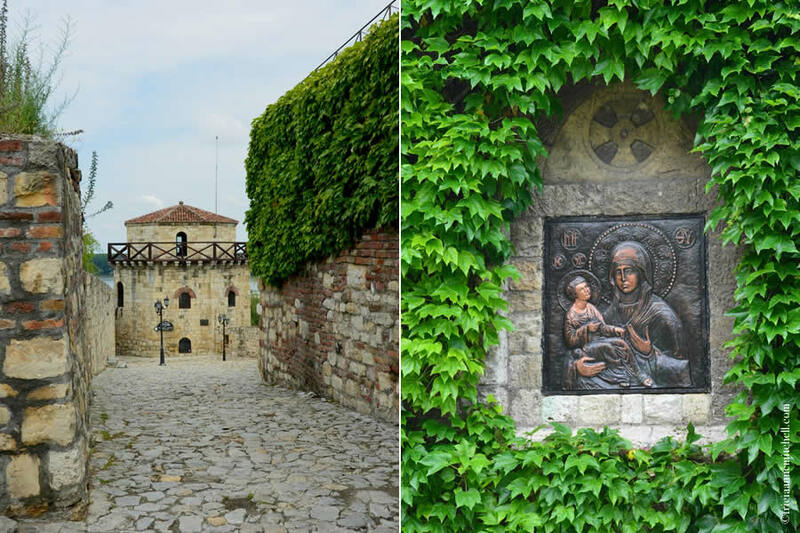 At the Belgrade Fortress, we stroll cobblestone lanes with Jelena, our host from the Tourist Organization of Belgrade, passing by the ivy-adorned brick walls of a church before stopping inside the Chapel of Saint Petka. Handing me a clear plastic bottle with the chapel’s likeness embossed on it, Jelena explains that the church had been built atop a spring that’s believed to be miraculous. “People drink this water to purify their bodies. It’s said to have healing properties,” she says. 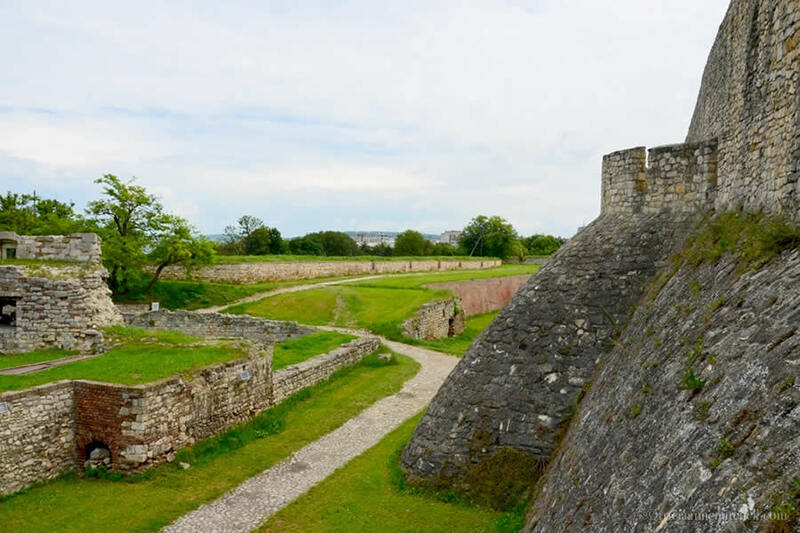 On a balmy, early-summer day, the chilled water is refreshing, and we sip from the dainty bottle as we walk the walls of the citadel, looking out toward the confluence of the Sava and Danube Rivers. “The rivers form a natural border,” Jelena explains. “The south side of the Sava is the Balkan Peninsula, and to the north of it, Europe.” In past times, this also delineated the boundary between the Ottoman and Austro-Hungarian Empires. 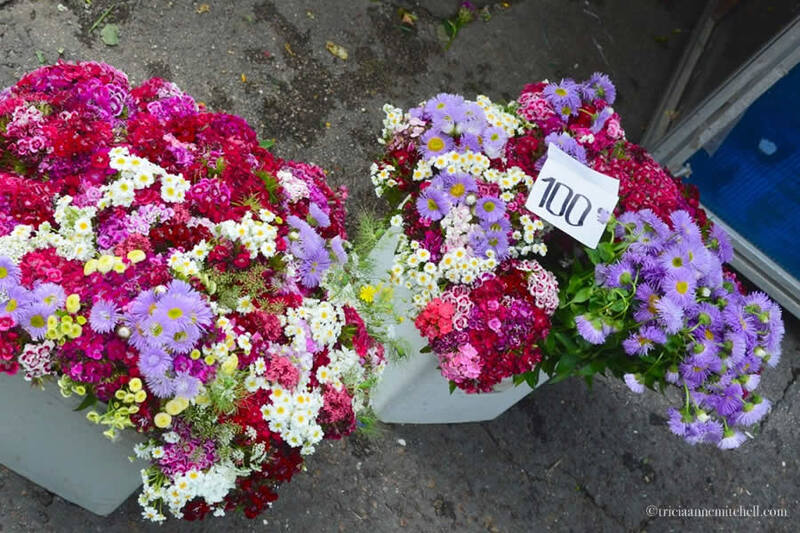 “Even today, life in Belgrade revolves around the Danube,” Jelena adds. 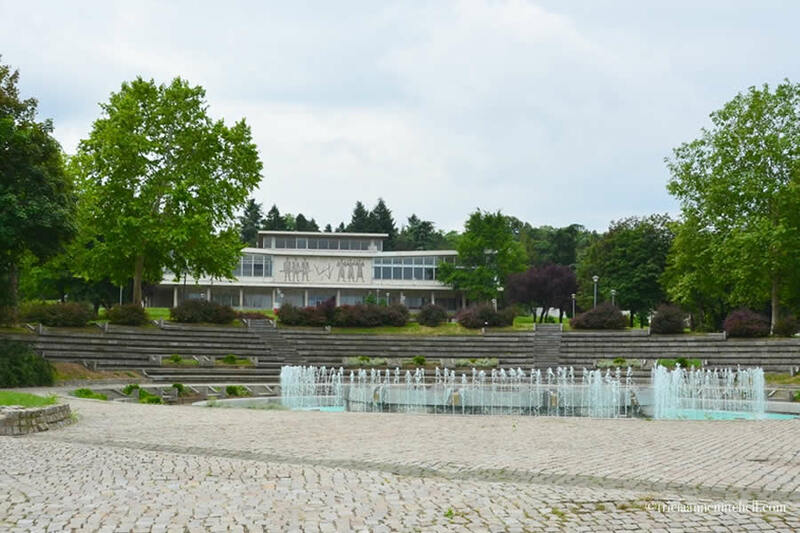 Jelena mentions the City on Water project in the works with aims to revitalize and redevelop the Belgrade waterfront, while transforming buildings formerly used for industry into residential, cultural, commercial, and sporting centers. 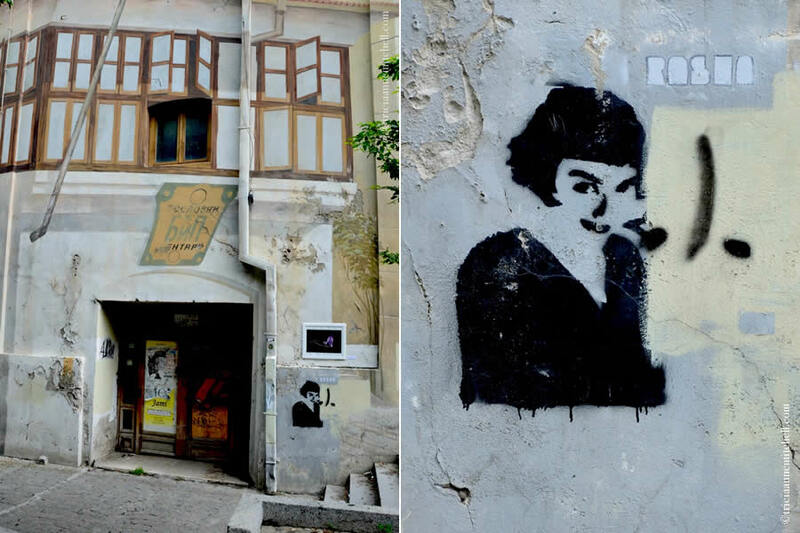 Next, we’re whisked off to Belgrade’s hip Savamala district, an area that had once been neglected and industrial but is now being turned into cultural centers, and art galleries. There are bars and clubs with names like Mladost (Youth), Radost (Joy), and Ludost (Craziness), and the neighborhood is especially busy during our visit as organizers prepare for the next week’s annual Mikser Festival. 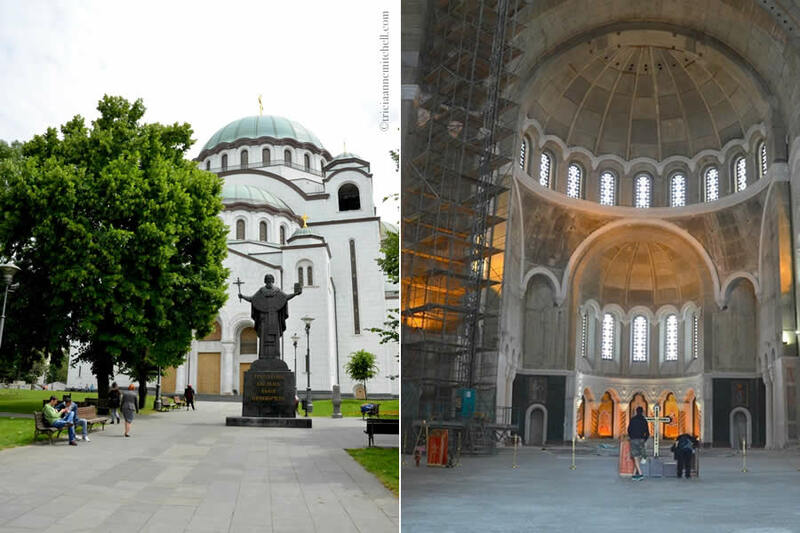 Turning our attention to Belgrade’s more traditional offerings, Jelena takes us to the grand Saint Sava Cathedral, which is currently being built and said to be one of the largest Orthodox churches in the world. With its white marble and granite façade, the church’s appearance echoes Belgrade’s name, which translates to ‘the white city.’ I enjoy having the rare opportunity of seeing a church construction in progress, and as we walk the unfinished concrete floors of the interior, past churchgoers lighting candles, I try to imagine the vibrant mosaics that will soon adorn the walls. On the way to lunch, we pass two government buildings destroyed during the NATO bombing of the city in the 1990s. Those televised moments had been my first introduction to the city, and it is jarring now seeing the still-bombed shells of these buildings in a thriving city. 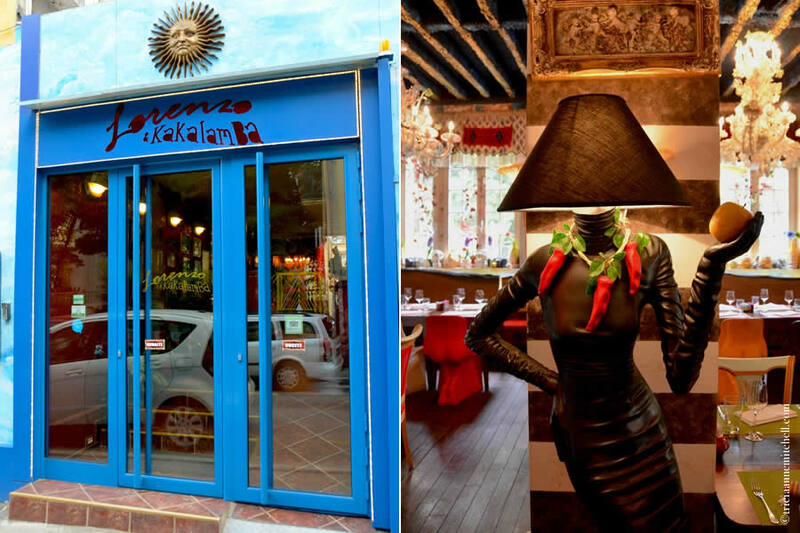 We arrive at Lorenzo & Kakalamba just in time to address our hungry bellies, but before we sink into the red and gold plastic-molded chairs resembling his & her derrières, we tour the restaurant, which serves a blend of Tuscan and southern Serbian cuisine. 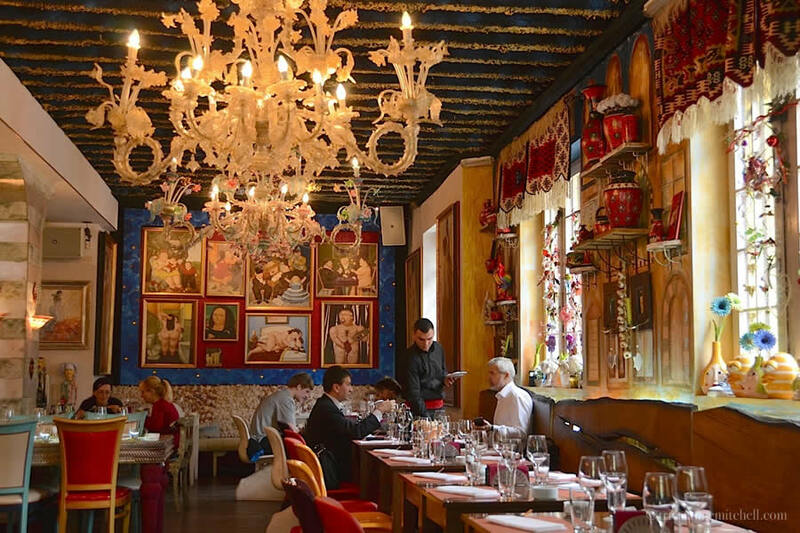 There are sparkling Murano glass chandeliers, goat figurines dangling upside-down from the ceiling, and a glass window in the floor to watch the cooks whipping up the cuisine. But the bathroom offers some of the quirkiest surprises: his & her chastity belts framed in glass display cases, and a likeness of Santa, sitting atop the men’s facilities. As each traditional southern Serbian dish arrives at the table, we discover that the restaurant’s food is not overshadowed by its elaborate interior. The fare abounds with cheese of all textures, flavorful vegetable combinations, and lots of meat. In keeping with my selectarian meat and gluten free-eating ways, I focus on the cheese platters, Ajvar, and salads, while Shawn also dives into the meat dishes. The food is rich and delicious, and well-complimented by a bottle of Sauvignon Blanc from the southern part of the country. 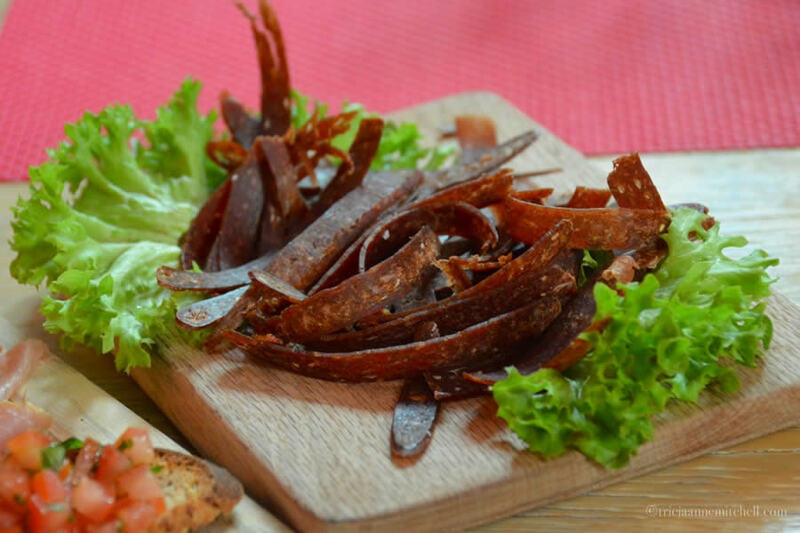 “In Serbia, a meal without meat is not considered a meal. You’ve probably noticed that much of our street food is based on meat – everything from Cevapi, to steak, and chicken wings,” Jelena says. As the plate of homemade Sarma (cabbage leaves stuffed with mincemeat) reaches the table, bubbly Jelena, cannot contain herself. 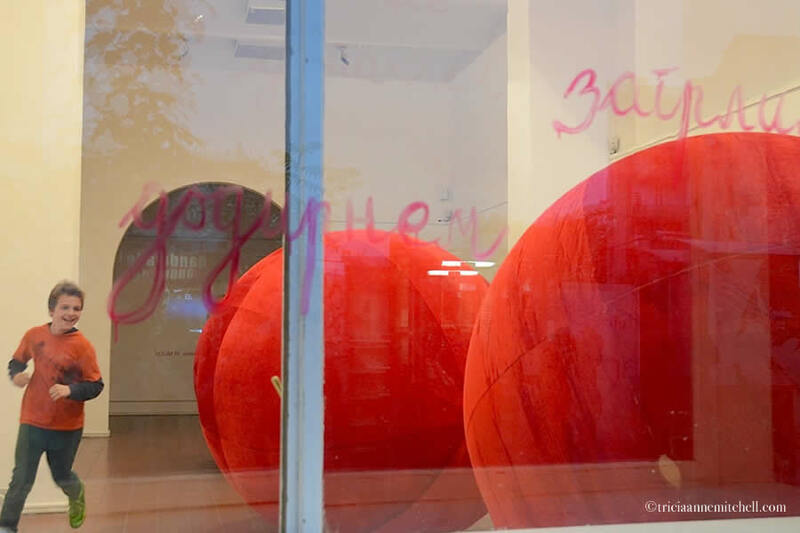 On a rainy day, children joyously play among gargantuan red balls in an empty storefront. 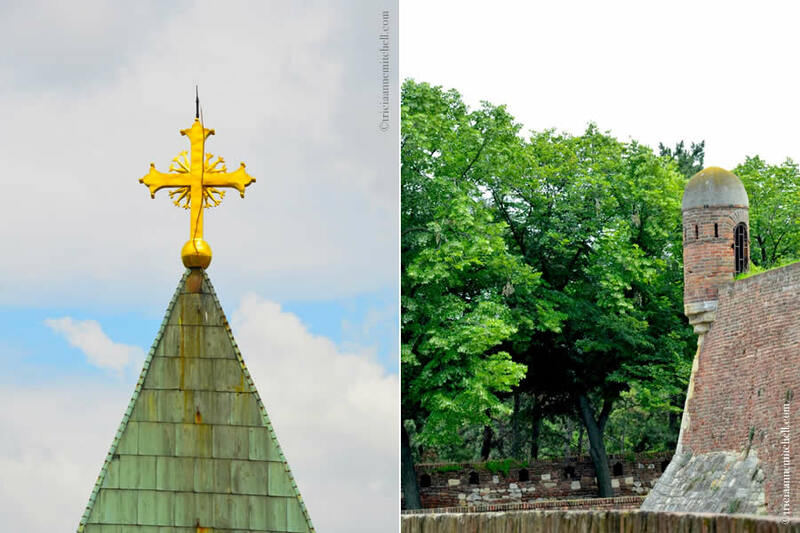 Inside Belgrade’s Fortress are several churches. 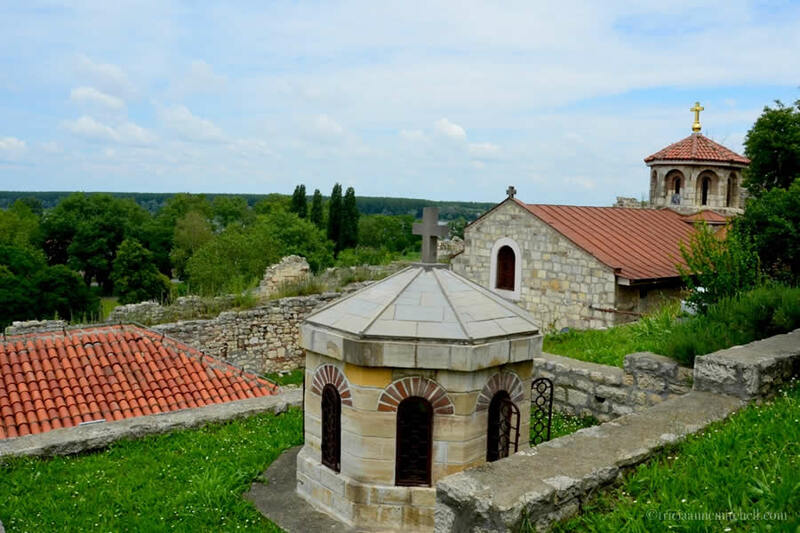 On the right is the golden cross-adorned dome of the St. Petka Chapel. 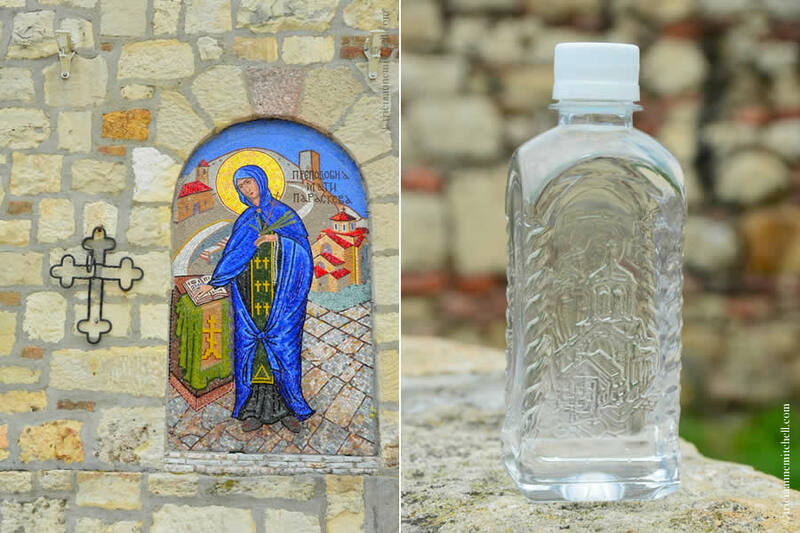 Vibrant detail on the Chapel of Saint Petka, and a bottle of water sourced from a nearby spring. It’s believed that the water has healing properties.The chapel’s also a popular spot for weddings and baptisms. Strolling through the Belgrade Fortress, with the ivy-adorned Ružica Church just around the corner. 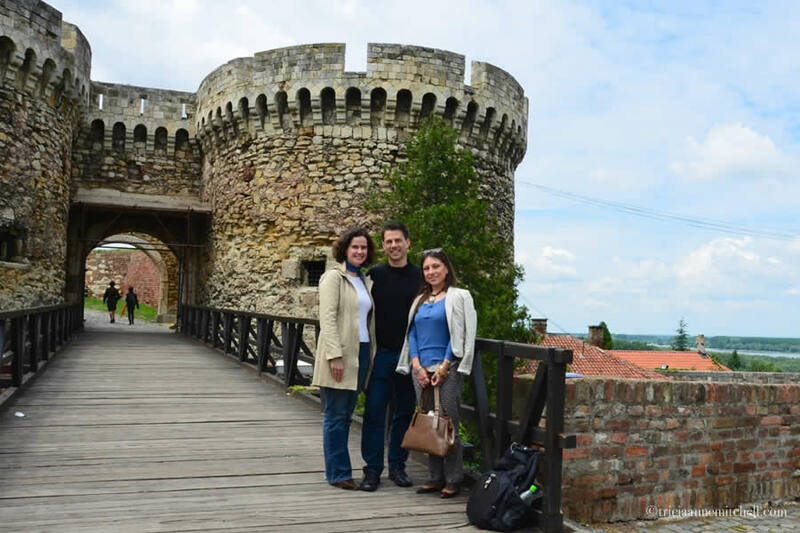 Pausing with Jelena, our gregarious host from Belgrade’s Tourist Organization, following a stroll through the city’s fortress. 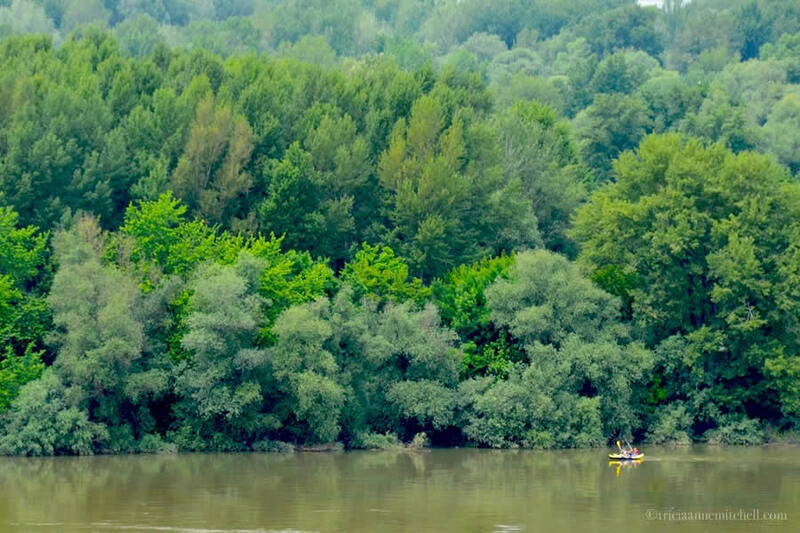 Kayakers at the confluence of the Sava and Danube Rivers, as seen from Belgrade’s Fortress. In an urban environment of 1.5 million people, it’s impressive that residents can be surrounded by nature in their own city. Men playing chess in Kalemegdan Park. As we ran into a café to escape the rain, we were curious what all these adults and children were doing. It turns out that they were serious soccer card traders. On the right, the Kinder egg playground equipment I couldn’t resist getting twirled in. Dizziness rapidly ensued! 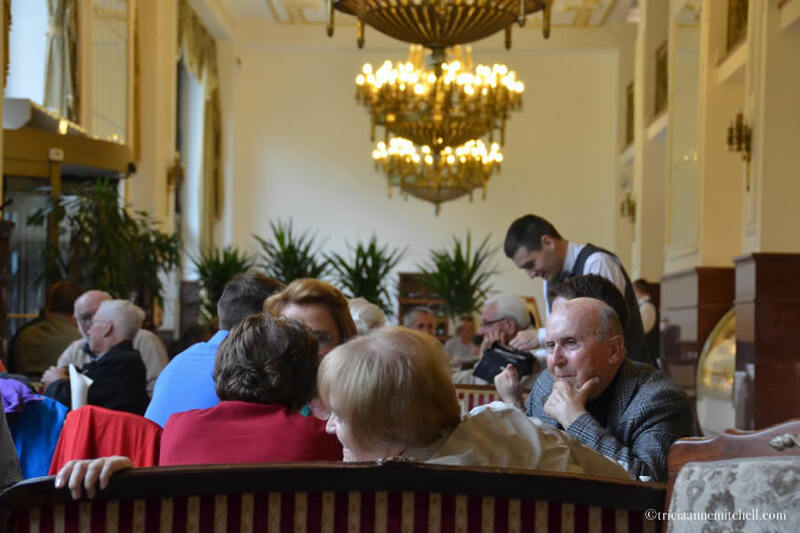 Café-goers at the elegant Hotel Moskva Café. We sought refuge from the rain in this Old World establishment, while enjoying cappuccinos and indulging in a bit of people watching. 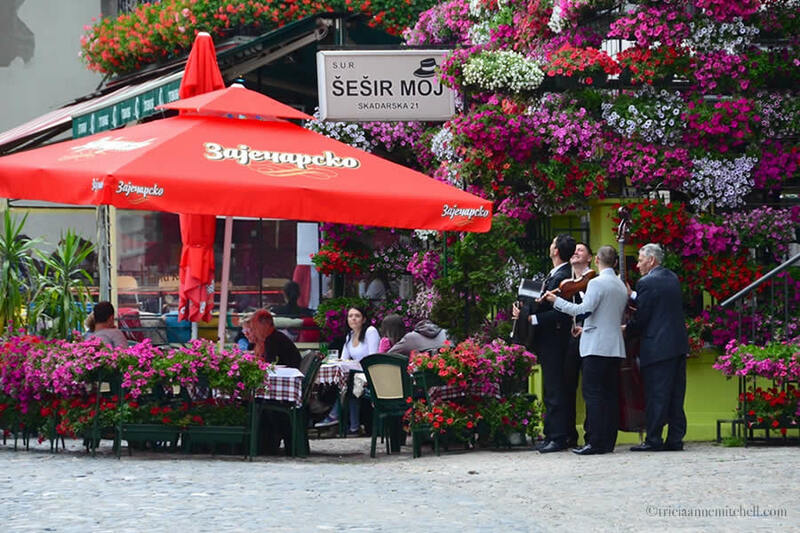 A restaurant facade jam-packed with flowers in Belgrade’s Skadarlija district while a quartet plays on. 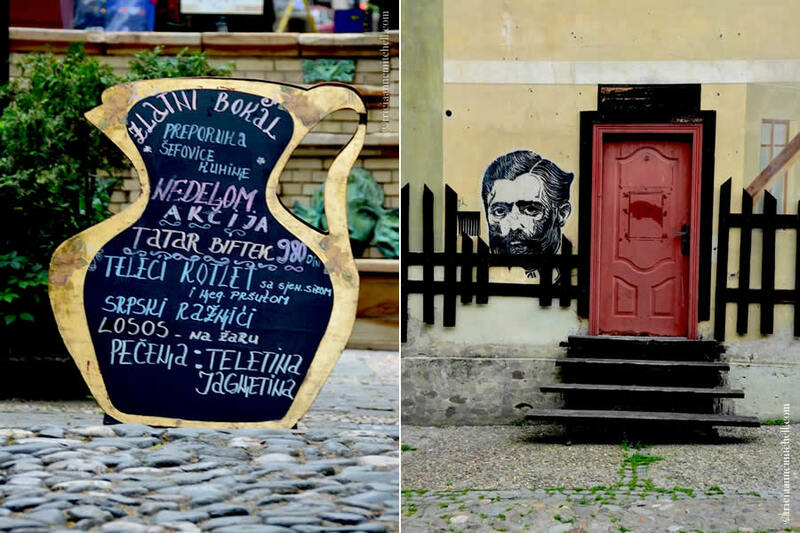 Skadarlija is known as being Belgrade’s bohemian quarter, and it has a feel of a mini Montmartre because of its cobbled lanes and bustling outdoor restaurants and cafés. A facade adorned with trompe-l’œil artwork, giving the illusion of 3-D shutters, and graffiti bringing to mind the French actress Audrey Tautou, from the film, Amélie. 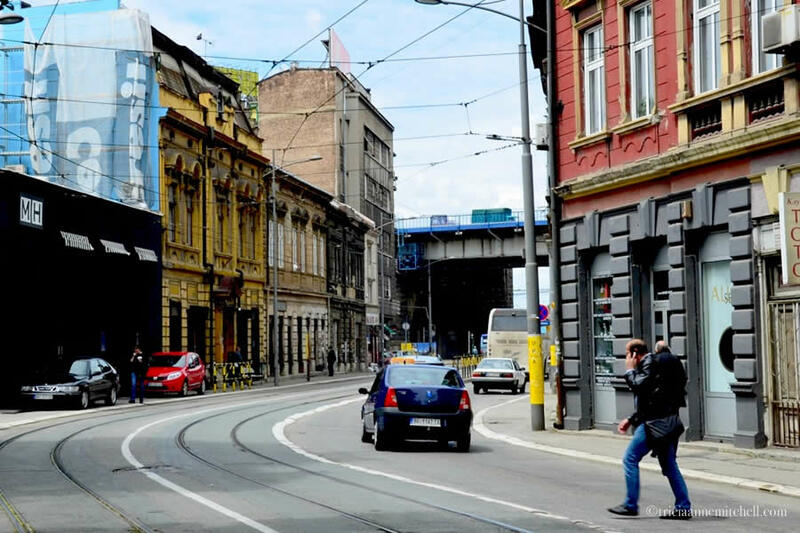 The Savamala district was previously abandoned, but today its once-dilapidated warehouses are being transformed into forward-thinking cultural centers, art galleries, bars, and clubs. It’s a great example of neighborhood revitalization and adaptive reuse of buildings. We regretted that we were in Belgrade a few days too early, otherwise we would’ve been in town for the neighborhood’s annual four-day long Mikser Festival. We popped into Savamala’s Mikser House cultural center for a few moments and could feel the creative energy in the air. People mingled with friends over coffee and lunch, or worked quietly on their laptops. 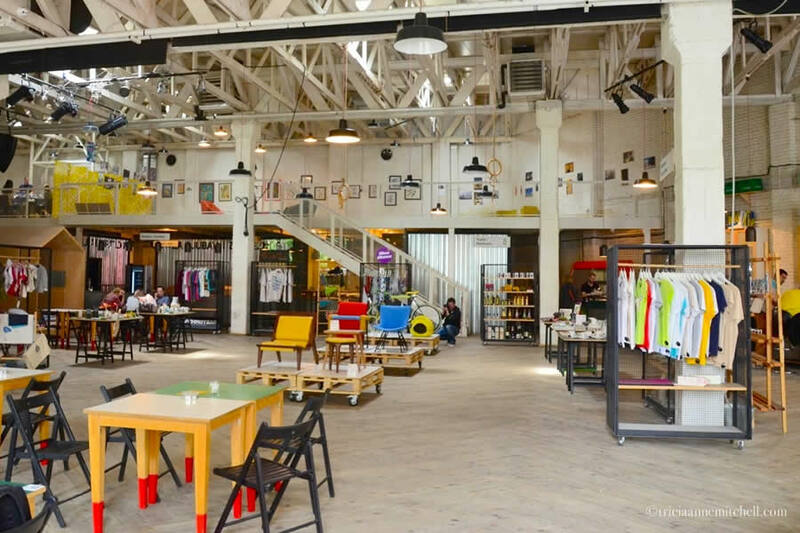 From cleverly-designed furniture, clothing, jewelry, and gastronomical goodies, from all parts of the former Yugoslavia, there were shopping opportunities too. 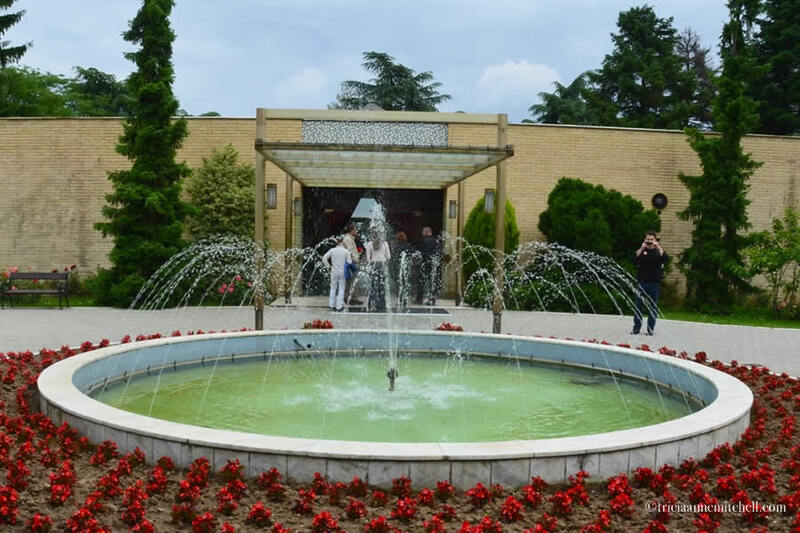 The facility even hosts music performances and creative workshops for children. The Saint Sava Cathedral, said to be one of the largest Orthodox cathedrals in the world. Its interior is still undergoing construction, giving visitors a unique opportunity to see a monumental work in progress. 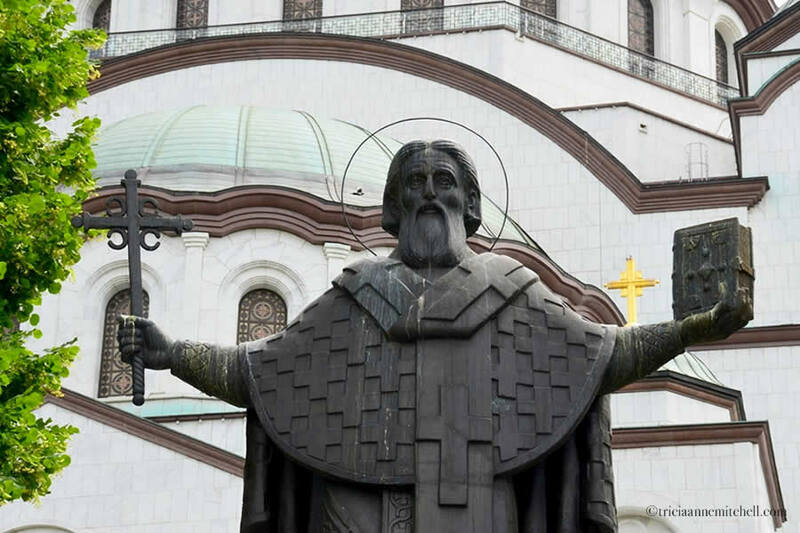 Statue of Saint Sava to whom the church is dedicated. He was the founder of the Serbian Orthodox Church. 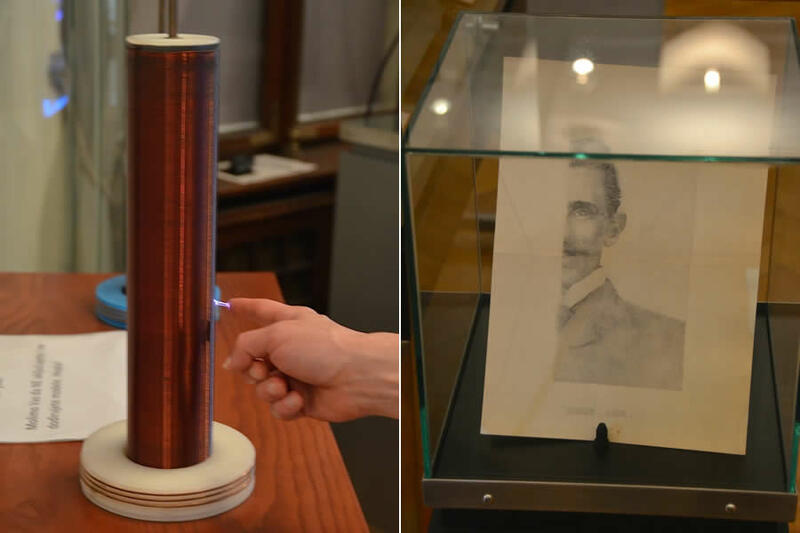 At the Nikola Tesla Museum, a documentary highlights the Serbian-American’s achievements in the field of electrical engineering. He is said to have registered more than 250 patents. Admittedly, I felt a bit out of my league learning his achievements, nevertheless it was fascinating seeing Tesla’s inventions at work and learning more about his genius mind. 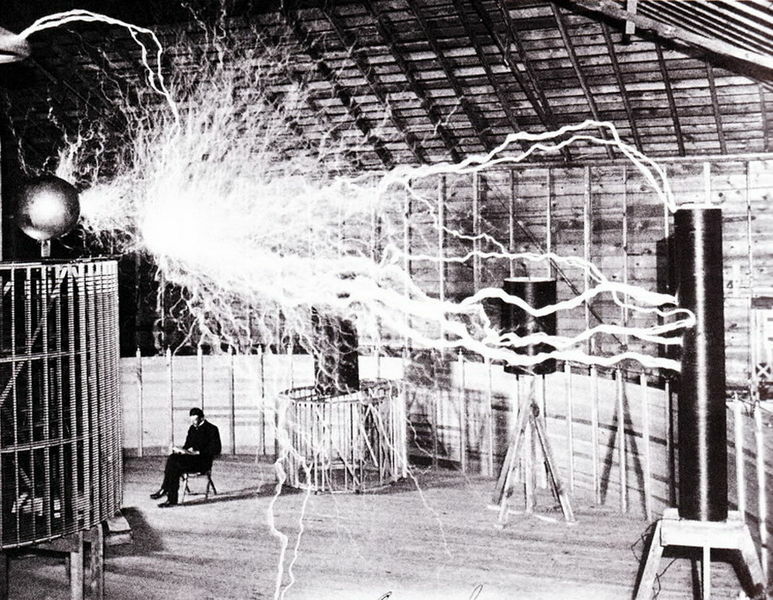 Here, an image of Nikola Tesla in his Colorado Springs lab. The lightning above him was produced by the largest of his Tesla Coils. Image is in the Public Domain, 1899. Next, we had the opportunity to experience a Tesla Coil first hand. Soon the fluorescent lightbulbs on the right, reminiscent of Star Wars light sabers, will all be wirelessly illuminated by the coil. Shawn, looking understandably intimidated as he watches the coil’s lightning bolt. The electricity was being transmitted through the air wirelessly, causing the lightbulbs in our hands to illuminate. This coil had an output of 500 KV, or half a million volts. 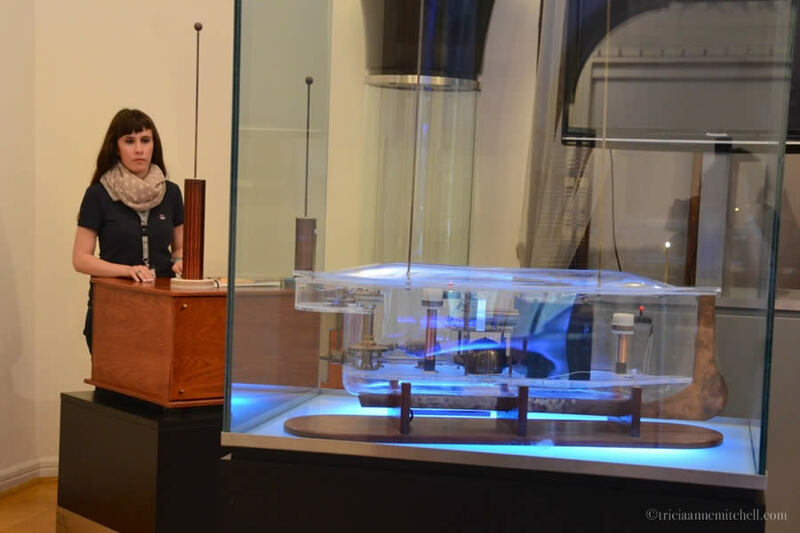 Museum guide Stanislava operates a reconstructed model of a remote-control boat. Though it’s believed that Tesla was not a fan of art, drawings and paintings given to him by artist friends are on display. On the right, is the ‘Egg of Columbus‘ demonstration of an induction motor. 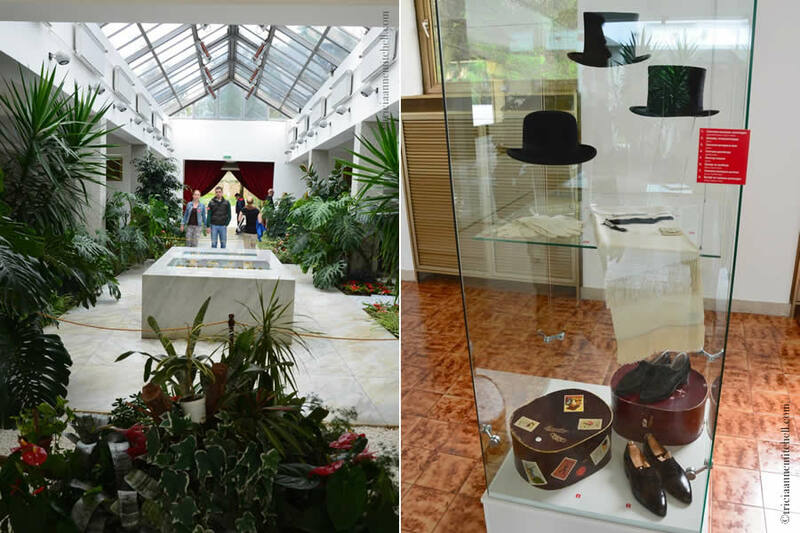 The Museum of Yugoslav History, including the House of Flowers where Yugoslavian leader Josip Broz Tito and his wife are interred. Tito was buried here in 1980. The House of Flowers was Tito’s summer house and office. 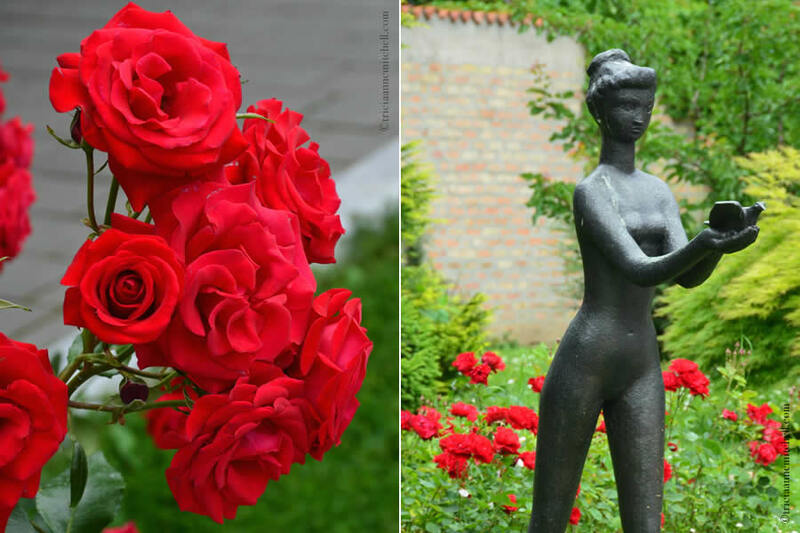 On the grounds are statues and gardens studded with roses and hydrangeas. The never-ending stream of visitors posing with a likeness of Tito. Entrance to Tito’s summer home and office. The mausoleum is also now inside. Our guide at the museum said that Tito was a hedonist. He loved women, elegant attire, travel, and wine. 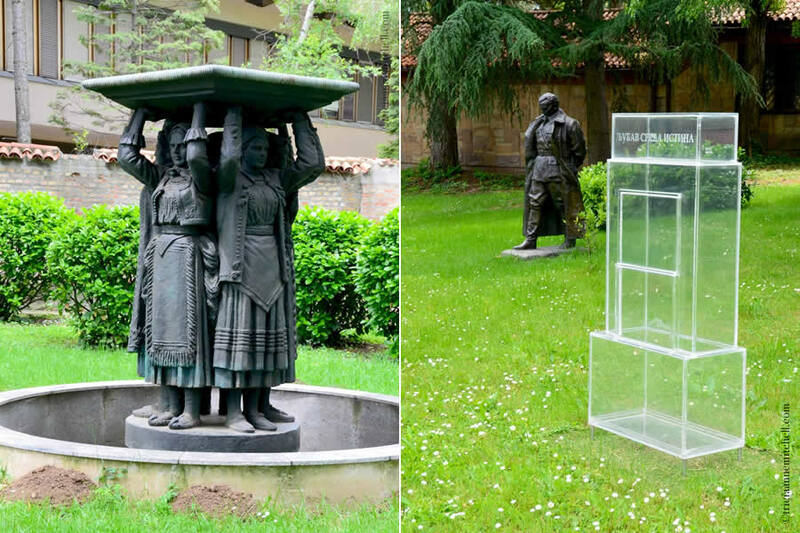 I appreciated the message behind Marta Jovanovic’s transparent sculpture, Love, Fortune, Truth, on the right, which was intended to show that heritage is visible from different perspectives. It seemed especially relevant given the different views we’ve encountered from people in countries that were once part of Yugoslavia. 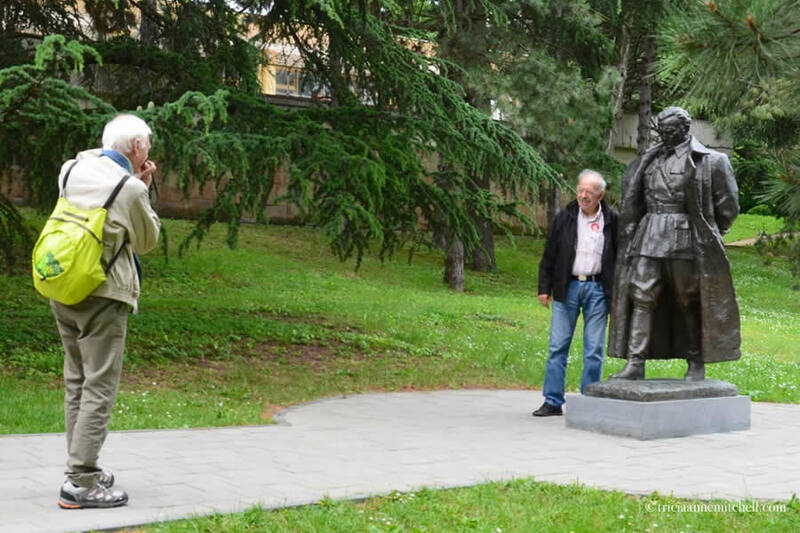 Whereas the other statues were on the grounds during Tito’s lifetime, this was the only one that was added later. On the left, Tito’s tomb. 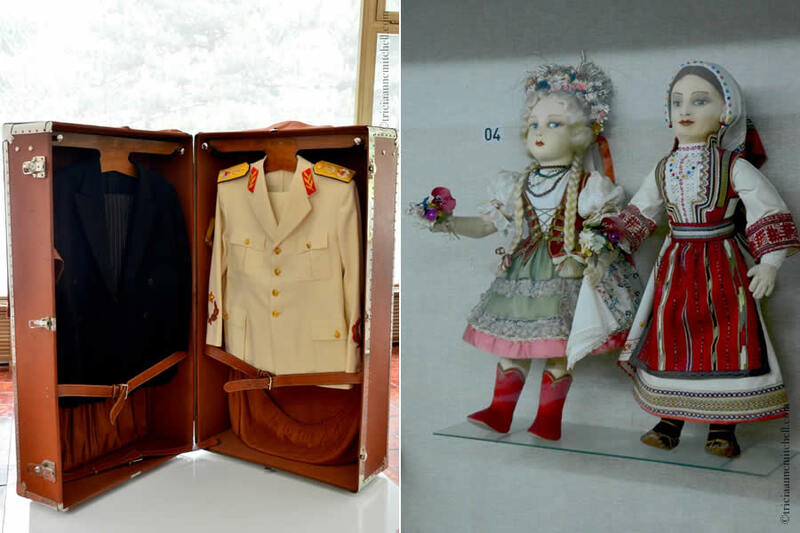 On the right, pieces of Tito’s wardrobe. He is said to have changed his outfits 3-4 times a day. 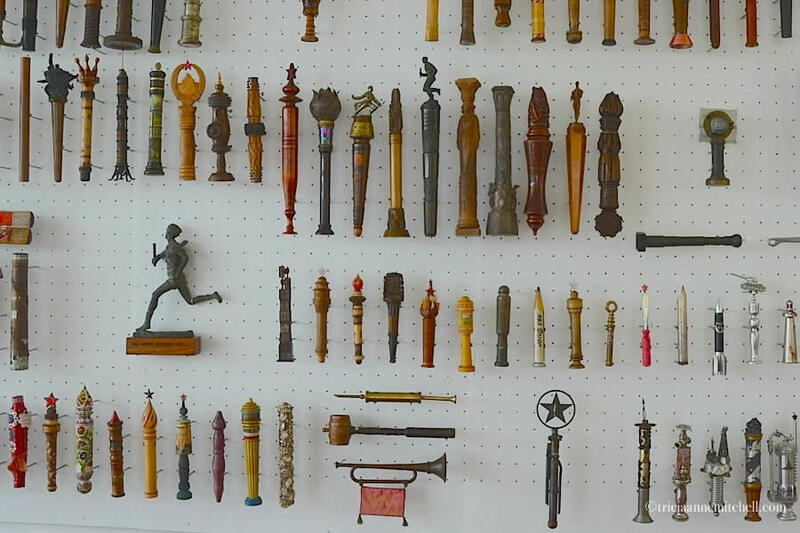 A sampling of the estimated 20,000 relay batons that were given to Tito. One afternoon we had lunch at the quirky and fun Lorenzo & Kakalamba restaurant which serves southern Serbian food and fare from Tuscany. 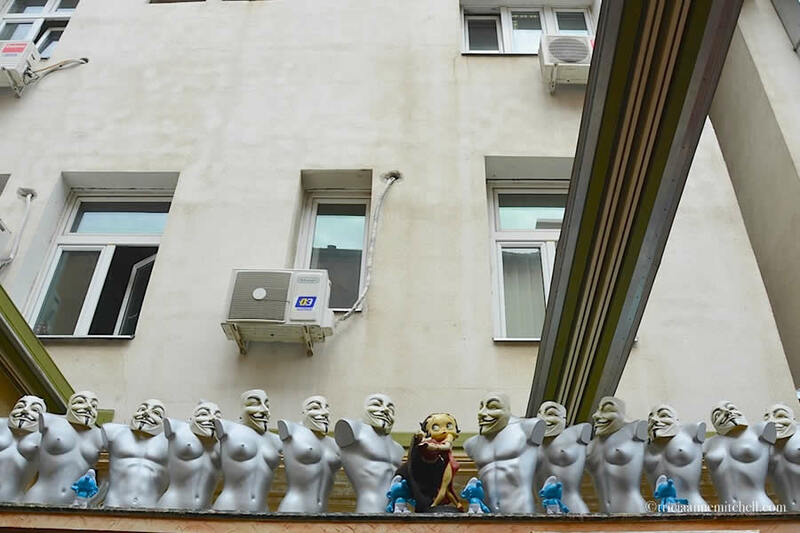 Betty Boop, mannequin torsos, and Smurfs mingle in the courtyard of the restaurant, hinting at the silliness to come. Even the restrooms offer surprises such as his and her chastity belts! Real apples serve as decorations under some of the tabletops. On the right, the restaurant’s distinct wine labels. 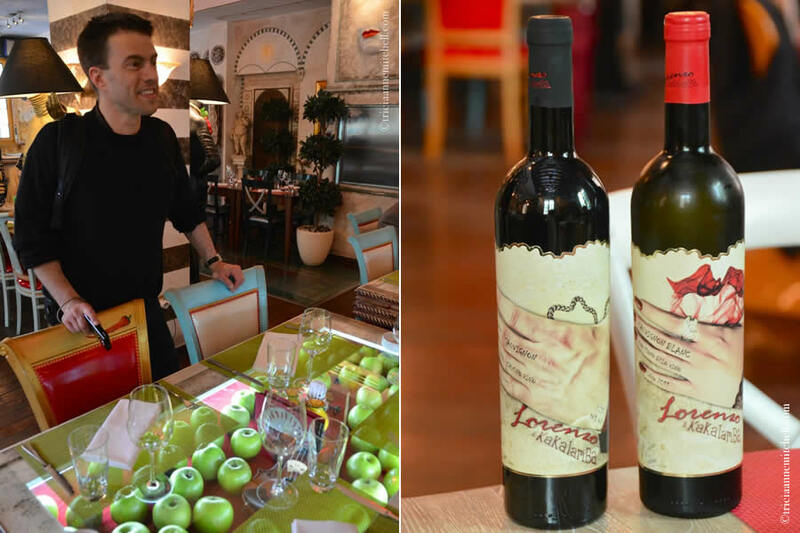 We sampled two wines from southern Serbia: Sauvignon Blanc and Cabernet Merlot. 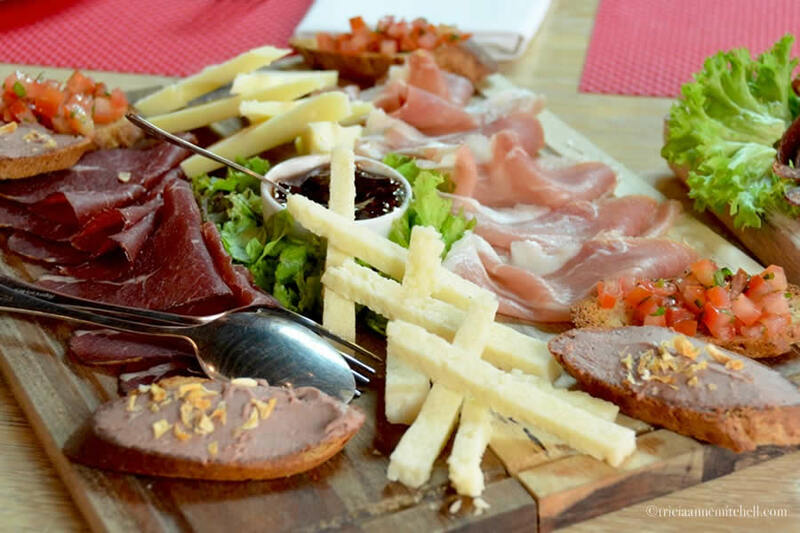 Serbian and Italian cuisines mingle on the starters’ platter: Prosciutto & Pršut, Pecorino Cheese, Tomato Bruschetta, and fig jam. Smoked Serbian sausage. Since I’m a ‘selectarian’ meat eater, Shawn was the taste-tester, noting that it was quite tender, with garlic and paprika flavors. Fabulous ajvar (a red pepper-based condiment popular in the former Yugoslavia), and melted Pirotski Kačkavalj cheese from southern Serbia, mixed with arugula. The ajvar was made with peppers from the owner’s plot of land in central Serbia. Chandeliers from Murano are contrasted by accessories with Serbian folk motifs. Manager Leta gets playful with our waiter. 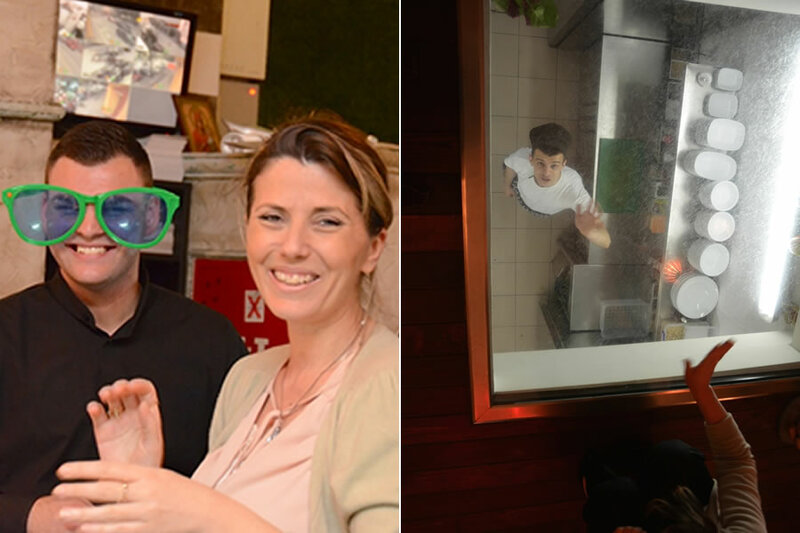 And, with a glass cut-out in the floor, you can watch your meal being prepared below. The feeding frenzy continues. 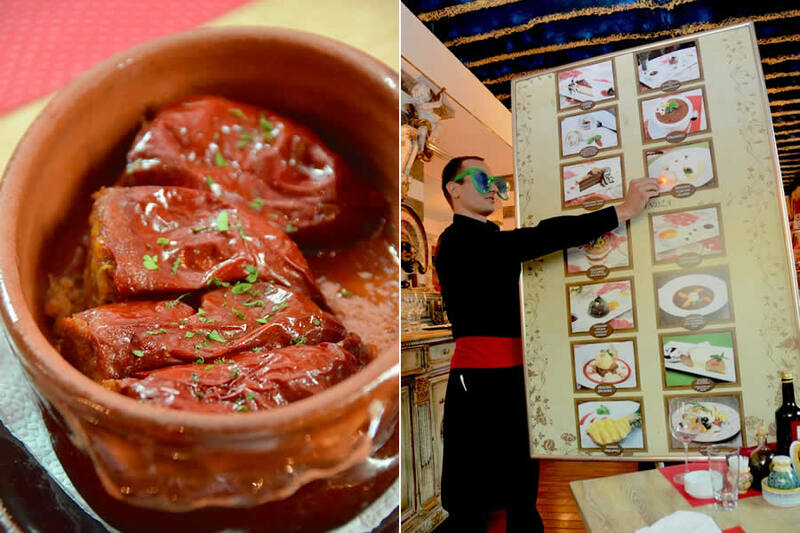 On the left, red peppers stuffed with mincemeat; Sarma (cabbage leaves filled with mincemeat), mashed potatoes; and lamb and roast potatoes – both cooked in a wooden oven. 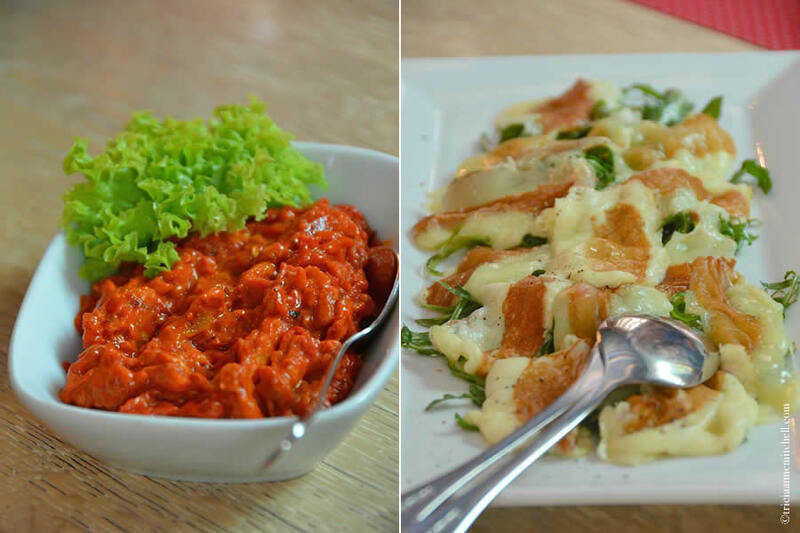 On the right, a bowl of a milky, creamy cheese, dressed with paprika and parsley. On the rectangular tray is Lamb Carpaccio. Jelena kept raving about the Sarma, mentioning that it was a popular dish in her family and something she hadn’t had in a long time since it takes so long to prepare. Red peppers stuffed with mincemeat and served in an earthenware dish. 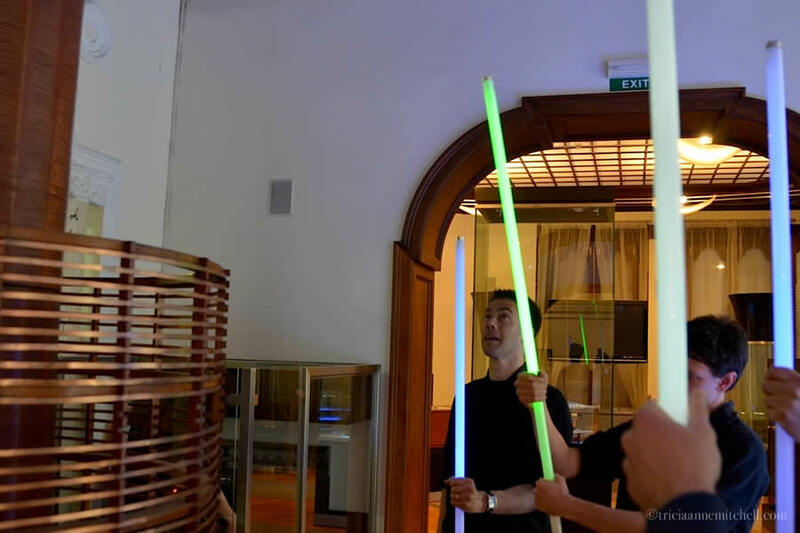 On the right, the restaurant’s playful tradition of bringing a massive dessert menu to the table, with the waiter pointing to options with an illuminated fingertip, reminiscent of E.T. Shawn’s brownie dessert wades in a sea of raspberry soup, adorned with white chocolate, vanilla ice cream, and almonds. 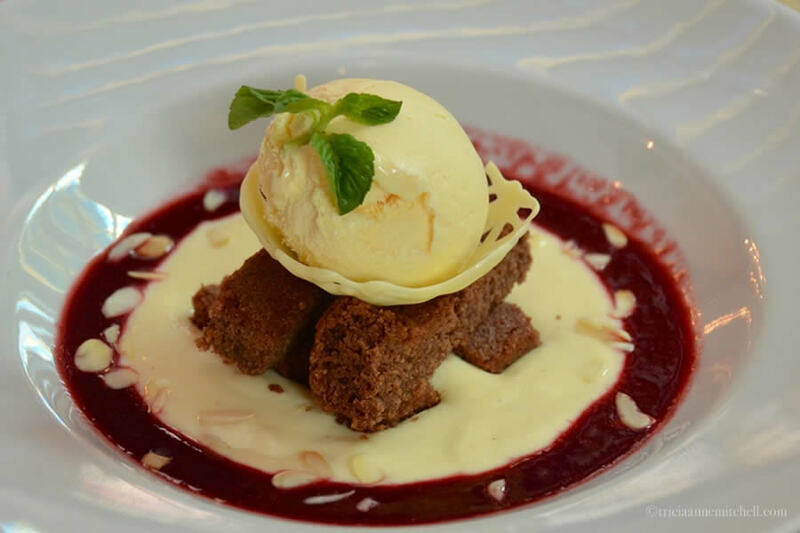 A bountiful serving of šnenokle, a dessert that’s popular in Serbia, and inspired by a French recipe. 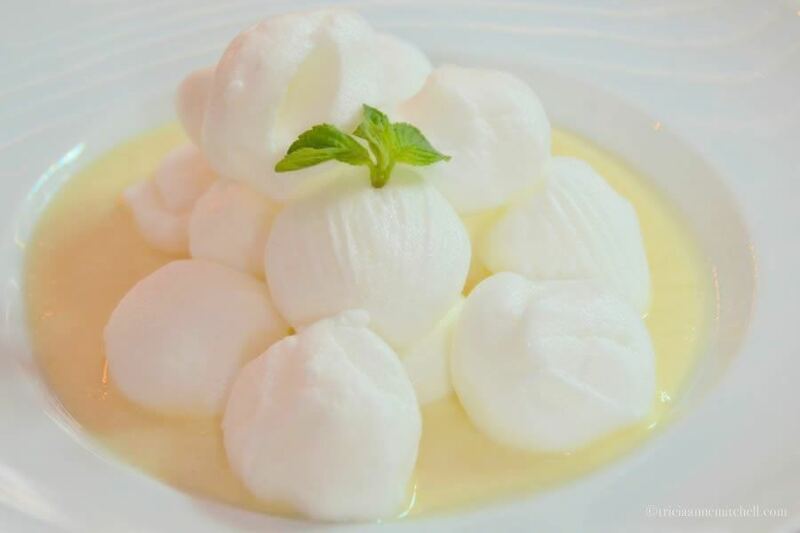 These fluffy snowball look-alikes are made with egg whites and vanilla. I found them to be the perfect light dessert following such a filling line-up of lunchtime fare. Need more inspiration? This link contains an index of all my posts from Serbia. 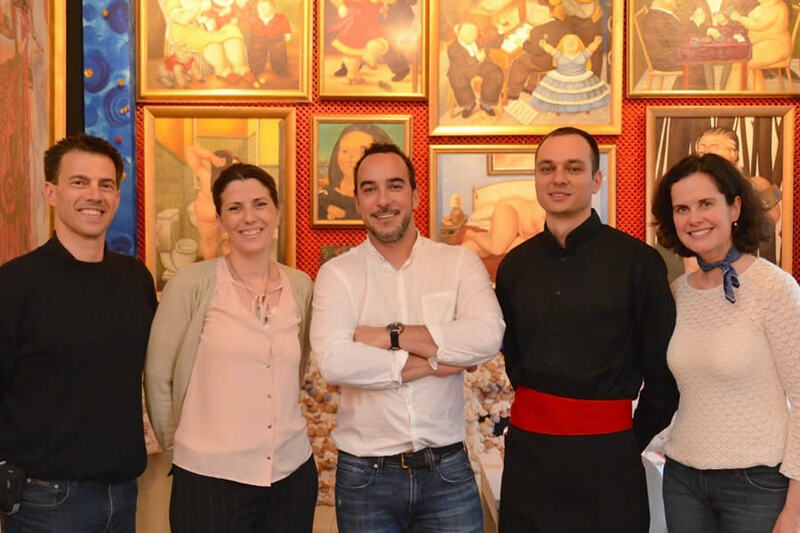 This day’s tour and lunch were provided by the Belgrade Tourist Organization, to which we extend thanks. A special hvala or Xвала to Jelena for coordinating all details of the whirlwind tour and for being our host extraordinaire, and to Lorenzo & Kakalamba restaurant, and Stanislava at the Nikola Tesla Museum. Photography & text © by Tricia A. Mitchell. All Rights Reserved. Video footage is courtesy of my husband, Shawn. Henry, you are quite the linguist! 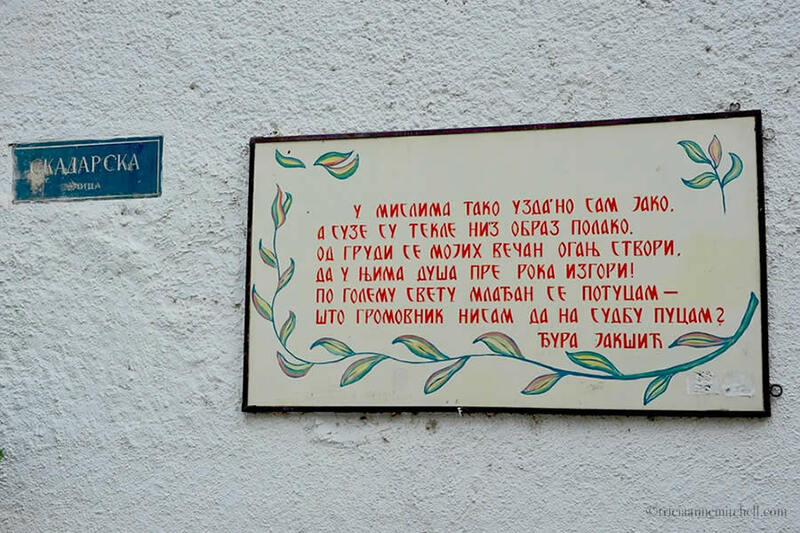 Having been recently tiptoeing through several lands that use the Cyrillic alphabet, I’ve been doing my best to learn it, but it’s still a challenge (first Macedonia, then Serbia, now Bulgaria). I’ve enjoyed seeing how the pronunciation changes as we cross borders. In many cases, our Serbian & Croatian vocabularies don’t work at all in Bulgaria, even though they’re all Slavic languages. I think that’s the nature of travel, isn’t it? Opening one’s eyes to an endless sea of new places! Serbia is a country we’d been curious about for a while. I’m thrilled that we were able to visit during warm weather, when the markets were overflowing with fresh produce. We are tempted to return when they’re making ajvar, the pepper-based condiment that’s popular in several countries that once made up the former Yugoslavia. 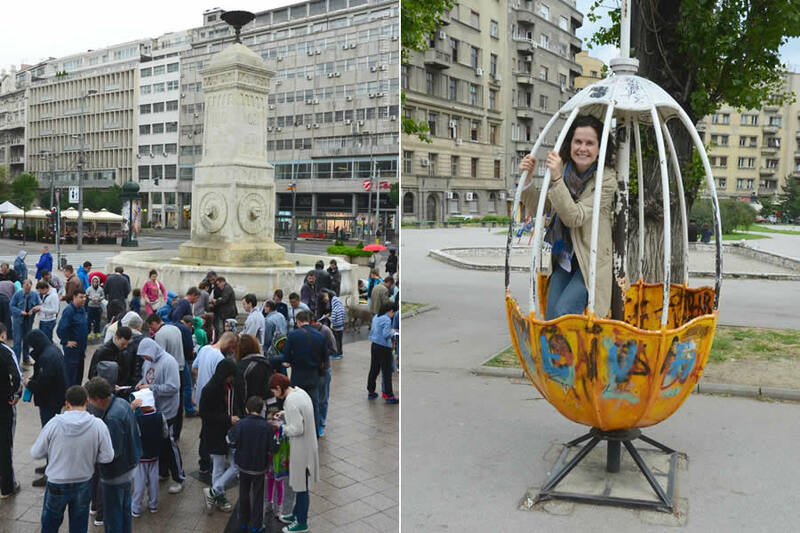 Your one day was well spent and well organized, Tricia, thanks to the Belgrade Tourism Association. Your photography compliments the day and ends with a heavenly feast that I could only envy. This city is really making a come back…alive and energetic, yet respectful of its traditions. Quite an organized and thorough city tour, Tricia. Your photos compliment the history, traditions and energy that you describe. The transparent sculpture really sums it all. Lovely. Lynne, I was also quite taken with the message behind the transparent sculpture, and impressed that the artist demonstrated respect for different views that undoubtedly exist in such a heterogeneous region. The former Yugoslavia was certainly a fascinating country. As we’ve traveled through its former republics, it’s been interesting talking to the locals and hearing their different perspectives on life then and now. Beautiful. Thank you for introducing the historical city. I would love to visit there someday. Glad you enjoyed the introduction to Belgrade. Having only spent two full days there, we left wanting to still see more spots, but it’s always fun to have an excuse to return to a place. Hope you’ll also get the chance to visit soon! gorgeous photos! And informative as ever, I love reading your posts for the little details I learn. There are such things as male chastity belts?? I assumed they were all for women so that the men in their lives could control them. And, Tito and his thousands of relay batons… interesting! 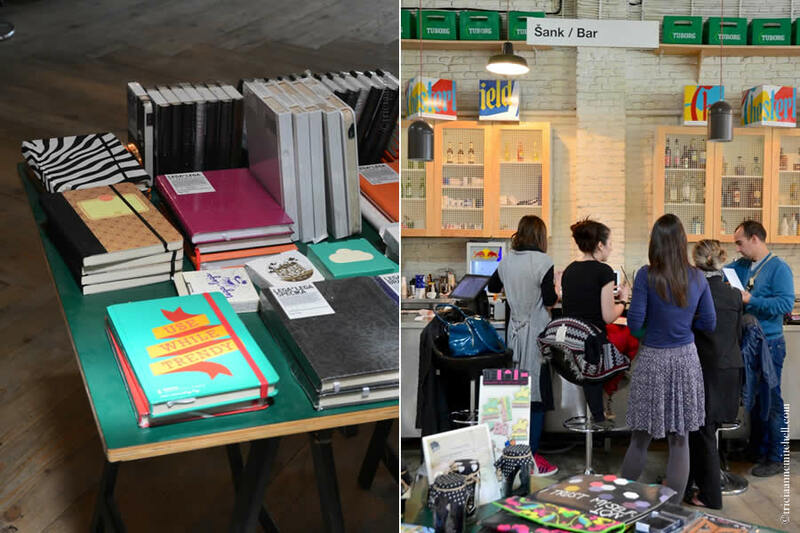 nylonliving, as they say in Serbia – hvala, thank you! From history to quirky facts, travel is indeed a fantastic teacher. 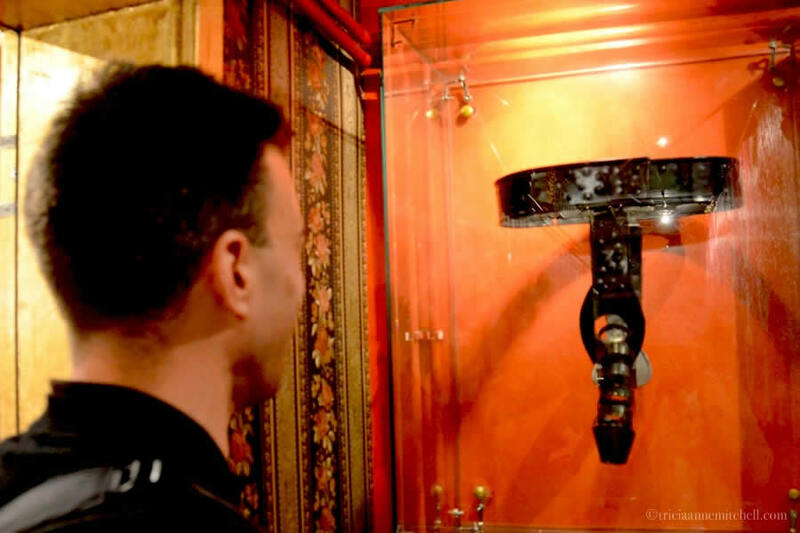 I also didn’t realize that there was such a thing as a male chastity belt; it’s funny that we had to voyage all the way to Belgrade to discover that tidbit. :) Thank you also for sharing our tales with your readers – I enjoy reading your thoughtful comments! What a wonderful homogeny, Tricia! And not a sheep in sight :) But I did love the egg! Jo, I had to wait in line, shoulder to shoulder with children, for the ride in the egg. :) Fortunately I hadn’t had a shot of the region’s beloved Rakia before whirling around. Obviously a quirky sense of humour at play with those chairs. 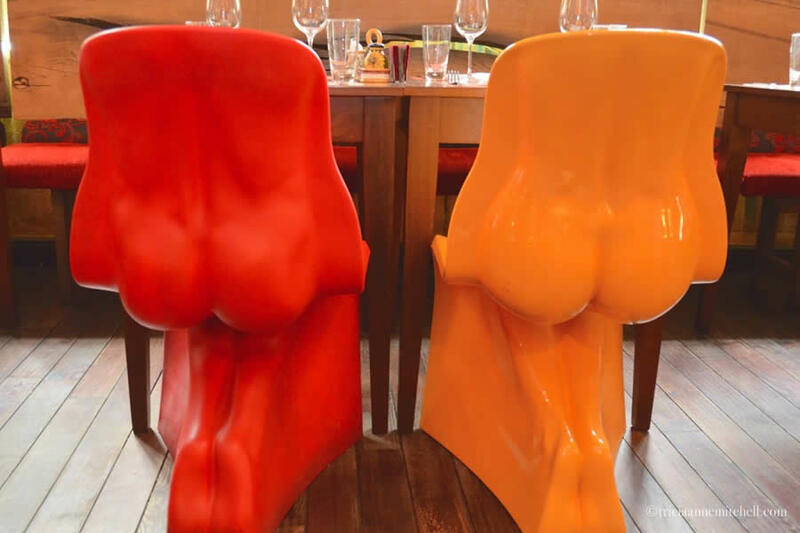 Not sure I’d fancy sitting in them for a meal, though. It’s someone else’s joke. Dorothy, your comment made me smile. :) We also opted out of sitting in those quirky chairs, deciding instead to be more regal and sit at the Lorenzo de’Medici-themed table. Great shot of the starter platter with prosciutto, cheese, bruschetta, and fig jam! As usual, I am all about the food. 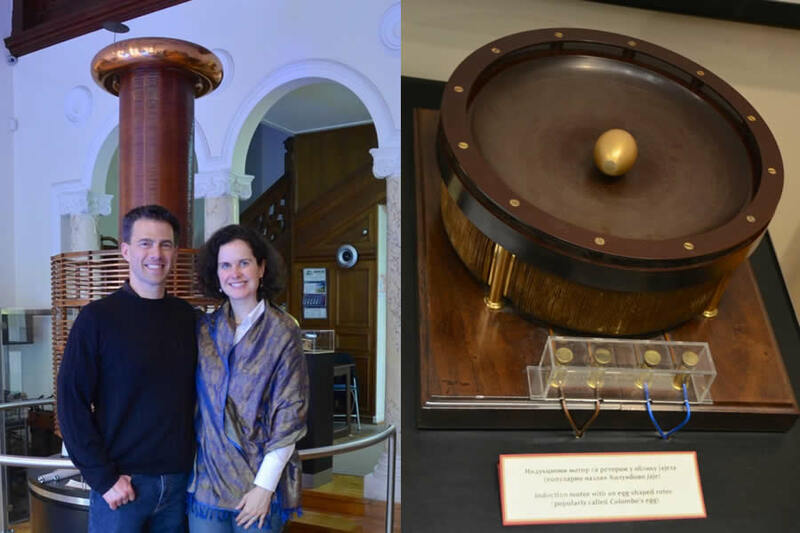 Well, food and the Tesla museum – which looks like a fascinating interaction with science. 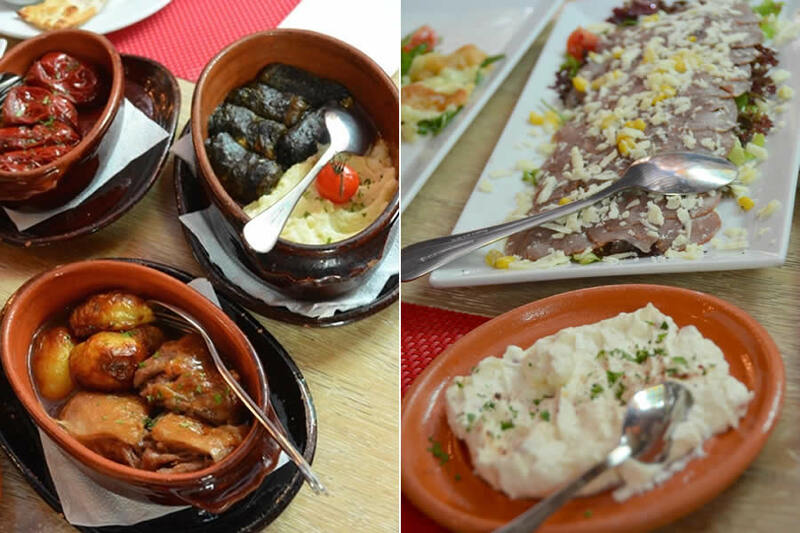 Eden, food also favors heavily in our favorite memories, and the cuisine of the Balkans is particularly tempting. Over the years, we’ve been fortunate to have been the recipients of many jars of homemade marmalade, thanks to kind people we’ve met along the way in Albania, Croatia, Macedonia, and Serbia. They’ve been similar to the fig jam that you mention from this restaurant, but each cook put his or her own special twist on it. Though I admittedly didn’t know enough about Tesla prior to our visit to Belgrade, the museum offered a nice chance to get out of my comfort zone. I think it’ll be hard to forget the initially-intimidating experience of standing underneath the crackling Tesla Coil. What a genius he was! 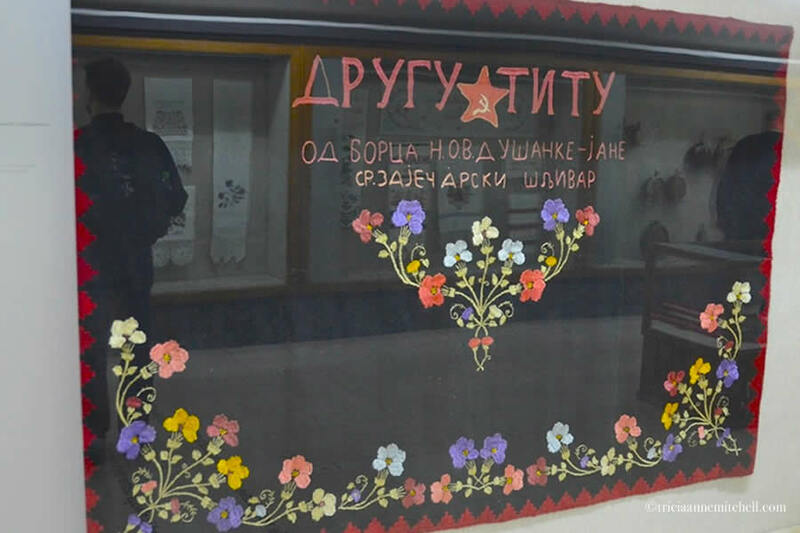 Have you visited any of the countries that once made up the former Yugoslavia? I will admit, I associate “Tesla” with the car, not with the electrical realm of high-frequency and high-voltage coils. And therefore, I appreciated the science lesson of sorts in your post. Standing underneath what appears to be lightning wouldn’t have been in my comfort zone either, but the great part about going out and seeing the world is the opportunity to learn! Eastern Europe is travel wish list…one day soon. Eden, I’ve seen a lot in the news about the Tesla Museum that’s in the works in NY. It sounds as though fundraising has been pretty successful so far – here’s hoping the project will soon come to fruition. Here’s hoping you’ll soon get to voyage to Eastern Europe. If you decide to head to the Balkans, I’m happy to answer any questions. Nice post, you had awesome city guide. Great perspective on Belgrade. Dusan, coming from a Belgrade resident that’s a great compliment – hvala! Since we were only there for a few days, we’d love to return and see more of the city. Are there any spots that you’d add to this mini guide? 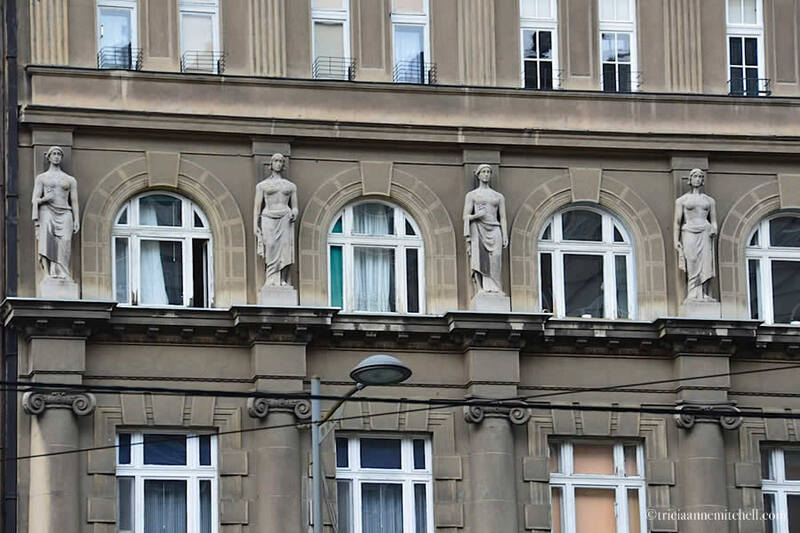 As a Belgrade citizen I gotta say that you got proper guidance here, which is very important because many travelers who travel to Belgrade just stick to the Belgrade’s downtown, which is actually just great “starting point”. Of course you can really find much to do there too, knowing that it is the cultural center of Belgrade too, but Belgrade is more than that, and I’m glad you got to check it out. All the best. Downtown Belgrade Citizen, I’m glad to have a local’s affirmation that this was indeed a fitting whirlwind Belgrade itinerary. :) If it hadn’t been for Jelena pointing us in Savamala’s direction, I’m not certain we would’ve made it there. We really liked the district’s creative energy, and could see ourselves working from the Mikser House. Perhaps upon our return!